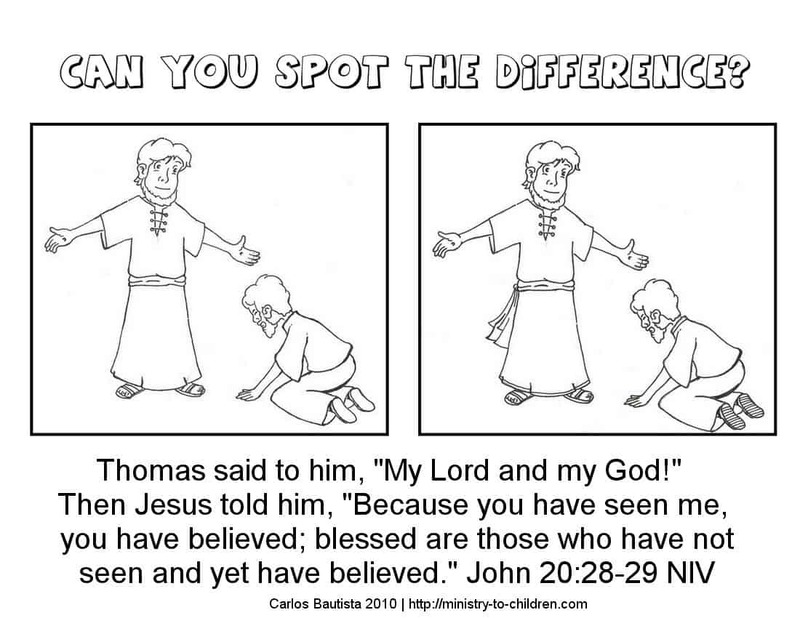 Here is a free ‘spot the difference’ worksheet for your Sunday School lessons about Doubting Thomas. It was sent to use from a reader in the Philippines named Carlos Bautista. This activity sheet was used created for their Vacation Bible School, but it would be a helpful addition to your Sunday School lesson. If you enjoy this worksheet, please leave an encouraging comment for Carlos and let him know how you will use it in your ministry. Directions: You can click on the preview image to the right to download this file as a printable PDF file. We’ve also uploaded it as a full jpeg image for advanced editing. 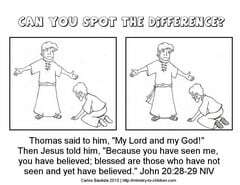 This Sunday School worksheet has two similar pictures of Thomas bowing down to Jesus after the resurrection. The children should coloring the pictures and then note the differences between the two images. This would be a good addition to your Easter Sunday School lessons. We’ve also included the text from John 20:28-29 which records Thomas’ response once he finds his faith. Need More Ideas? We have uploaded a Doubting Thomas coloring page that uses only one image from this worksheet. We also have many more free Sunday School coloring pages on our website. Thanks to you and others like you I get all kinds of good activities in papers to do with my children’s church and our little church on Otis Rd., Jacksonville, Florida thanks for all you do for the Lord’s work. May God bless you! Tony Kummer (Editor) reviewed & updated this page on : May 3, 2011 at 8:57 am. All our content is peer reviewed by our readers, simply leave a comment on any post suggest an update.